The underground labyrinth is extremely large, and changes its form the deeper it goes. 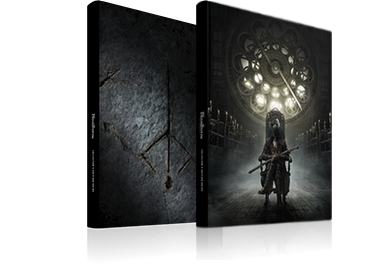 Each part has its own unique appearance and tendencies, though, and these are divided into four distinct areas: Pthumeru, Hintertomb, Loran and Isz. Hintertomb dungeons are dark and have a strong tendency towards poison. Bodies of water in Hintertomb dungeons are often poison swamps. Smoke coming out of burners is a poisonous fog. Some enemies have the Poison special effect, signified by a purple mist around their weapons. Watcher's Madmen guard floor levers. Before crafting the Hintertomb, you should go to Hemwick Charnel Lane to level up and collect Twin Bloodstone Shards for your main weapon. You can also find the Bloodshot Eyeballs there that are a requirement in this dungeon's Chalice Ritual. Defeating the Witch of Hemwick boss will unlock Bloodshot Eyeballs for purchase at the Insight shop in the Hunter's Dream. The major difference between Hintertomb and Pthumerian labyrinths is that many enemies encountered in the Hintertombs will attack with poison, made visible by a purple could around their attacking weapon. There are some oil urns standing near a cage in the middle of the open area here, and some Labyrinth Watchers on the floor above that will throw Molotov Cocktails down as you exit the tunnel. To avoid the risk of getting blown up as you pass by, shoot the oil urns with a gun from a safe distance. The loud noise this causes will usually make some of the other enemies from the floor above drop down to investigate, so make sure you're ready to take them on. An Eye Collector will either rush down to attack you if you did not draw the enemies through the tunnel at Step 01, or ambush you with a grab when you enter this room - try to stick close to the wall on the left as you enter and move slowly. This should cause her to miss, and you can kill her before she recovers The only other enemies in the room are some Labyrinth Watchers, so take them out as you come to them on your way to the lever at the far end. A group of enemies that have been summoned by a Bell Ringer are gathered just beyond the door here, so before opening it, strike the door with your weapon to kill the enemies on the other side Once you've opened the door, quickly run.up to the staircase on the right and use it to reach the Bell Ringer on the ledge in the middle of the room. The other staircase in this room has been blocked off at the top by a cart, so continue up the one on the right and kill the Watcher's Gravedigger at the top. A Watcher's Gravedigger armed with a gun will start firing at you from the top of the stairs to the right as soon as you enter this room, so quickly run forward and use the statues at the bottom of the stairs for cover Wait for it to reload, and then run up the stairs using the statue at the top for cover, and kill the Gravedigger while it's reloading. While you would normally be thankful for the cover that can come from pillars in a boss room, the Maneater Boar here can break through those pillars with its charge attack, so never assume you're safe behind them. Upon defeating the boss you'll receive a random Blood Gem. There's a Bell Ringer in the room on the mid level ledge down to your right. Funnel any Labyrinth Watchers she may have summoned through the entrance to this room to kill them one by one before entering. Then, turn right and head down the stairs until you reach the ledge in the middle of the room, where you should find the Bell Ringer. Entering this room from the path at the top will put you in a much better position than from the door at the bottom of the stairs, because there's a Watcher's Gravedigger with a gun standing at the top of them. By using the top path you can kill the enemy near to the Gravedigger, and still be able to sneak up behind it and use a charged R2. Another Gravedigger, this time armed with a pickaxe, is at the bottom of the stairs. Once it spots you, wait for it to reach the top of the stairs and fight it there. The Labyrinth Madman guarding the coffin in this room is extremely fast and aggressive, so you should make sure to take out the Rabid Dog in the room first. Try using the trees to block the Madman's dashes, and attack him whenever you see an opening. If you quietly walk around to the right after entering this room you'll be able to sneak up behind the Watcher's Gravedigger standing in the middle and land a charged R2 on it. When you come back into this room after pulling the lever to open the gate later, a Bloodlicker may have taken up residence where the Gravedigger was previously standing to feed off his corpse. A toxic liquid that inflicts Slow Poison and slows your movement coats the floor of this corridor, so try to run through it as quickly as possible while avoiding the poison throwing knives coming from the Labyrinth Watcher near the opposite end. Getting hit by even one of those knives while in the poisonous liquid will be enough to poison you. The middle of the raised motif on the floor just inside this room is actually a pressure plate that, when stepped on, will cause a group of four Labyrinth Watchers to appear around you Either avoid stepping on it or be ready for the enemies when they appear. The floor of this large cavern primarily consists of a poisonous swamp, but there are some patches of dry land scattered about, so try to run between them and stay out of the swamp as much as possible. A lone Undead Giant can be seen near the center of the room and the cannon it's armed with is extremely dangerous; if you intend to fight this enemy, it's recommended that you drop down off the walkway near the entrance and approach it from behind, so that you can get close without it detecting you. A very large group of Labyrinth Rats swarm near the entrance to this room, and just on the other side of them is a Wandering Nightmare; try to lure some of the rats out of the room and kill them there, so that you have a clearer path to the Wandering Nightmare Even once the rats are dead you'll need to be very quick in killing it, because shortly after you enter the room a Labyrinth Madman will start running towards you, and they can close the distance very quickly. If you need to create some space when you're ready to fight it, run around some of the broken cages in the room. The group of oil urns in the middle of the room here should give you a hint that if you were to go out there, a Labyrinth Watcher on the floor above would start to throw Molotov Cocktails down at you. There's also a very large group of enemies in the next part of the room and if you shoot the urns, the sound of the explosion will lure a lot of them towards you, which is actually beneficial. The Labyrinth Rats will be the first ones to reach you, so take those out as they round the corner, and then wait for the Watcher's Gravediggers and do the same. Now when you enter the room you'll be able to concentrate on the Gels and Rotted Corpses in the water. The Undead Giant here is a slightly stronger version of the one from the large cavern earlier, and as such your main goal should be to stay close enough so that it doesn't use its cannon. Once you defeat it you will get the Hintertomb Root Chalice, which lets you create randomly generated Hintertomb Dungeons. After killing the group of Labyrinth Watchers by taking them out one at a time through the narrow entryway to this room, run straight ahead to kill the patrolling Bell Ringer. There's also a second Bell Ringer at the top of the stairs in this room, so kill any Labyrinth Watchers that are in your way, and then run up and kill her to prevent more of them from spawning. If you sneak around to the left-hand side of this room after entering it you can get around to the back of the Labyrinth Madman and Watcher's Gravedigger that are standing guard by the coffin at the back of the room. Once you're close enough, use a charged R2 in the back of the Madman, since he's the greatest threat. If he survives, follow up with a Visceral Attack and then take out the Gravedigger. When you first enter this room a Watcher's Gravedigger will start firing at you from the top of the stairs, and while it may be tempting to run up there and attack it, a more cautious approach is called for. Out of sight at the top of the stairs is a Labyrinth Madman, and he'll start running down the stairs as soon as you step on to them. Wait for the Gravedigger to reload, and then step onto the stairs so that the Madman starts running at you - now lure him back out of the room and fight him there, so that you don't have to worry about the Gravedigger. As you approach the junction here you'll begin to hear the sounds of the giant boulders crashing down and rolling along the corridor. There is nothing in the room to the left at the junction, so wait for a boulder to roll past, and then follow along behind it to the right to reach the room at the end There are four Watcher's Gravediggers armed with guns in that room, but if you make your way around the outside of it, you can use the pillars for cover while you systematically take out the enemies. In addition to the poison that the Blood-starved Beast exudes towards the latter part of the battle, you'll also have to contend with the fact that a large portion of the middle of the room is covered in a poisonous liquid. Try to keep the fight on the outer edges of the room where the ground is solid, to reduce the risk of getting poisoned. Upon defeating the boss you'll get the Lower Hintertomb Chalice that lets you explore new depths within the Hintertomb section of the labyrinth.